*NOTE: This recipe must be prepared one day in advance. Preheat oven to 300 degrees F. In a medium bowl over a slow simmering water bath, melt the chocolate and butter until warm. Remove bowl from water bath, drying bottom of bowl to remove any water. Add eggs and sugar, and whisk to incorporate. Pour mixture into a parchment paper-lined 13” x 9” baking sheet. Place the baking sheet onto a larger baking sheet and place in the oven. Before closing the door, carefully pour hot water into larger baking sheet to create a water bath. Bake until chocolate mixture is set and firm to the touch, about 15-20 minutes (if the cake begins to puff up like a soufflé, it is overcooked). Remove the cake from oven and allow to cool to room temperature. In an electric mixer, whip heavy cream until firm. Set aside. In a medium-sized bowl over slow simmering water bath, melt the chocolate until warm. While chocolate is melting, separate the eggs and place the whites in a mixing bowl. Slowly whip egg whites, adding sugar in three separate batches, until they reach medium peaks. Remove melted chocolate from the water bath and wipe the bottom of the bowl to dry. Using a whisk, incorporate egg yolks into chocolate. Next, add one-half of the whipped cream and whip until incorporated. Then, with a rubber spatula, fold in the remainder of whipped cream. Lastly, gently fold egg whites into the chocolate mixture, but make sure to stop folding as soon as all the egg whites are incorporated. Place each ring mold on top of the flourless chocolate cake and press down until it is all the way through to the bottom. Twist the ring and remove it with the cake inside of it and place it on a clean parchment paper-lined pan. Scoop the chocolate mousse into each mold, filling to the top of the rings. After all of the rings are filled, lightly tap the pan on the table top to release any air bubbles. 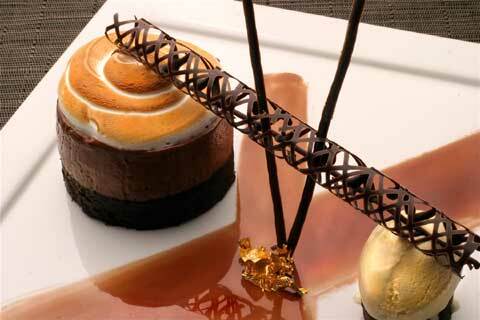 Using a palette knife, spread the mousse over the top of each mold so that it is flat and smooth. Refrigerate the entremets overnight. The next day, after the mousse is completely set, use a torch to heat the outside of each ring mold. Carefully slide the ring mold off of the mousse. When all of the entremets are unmolded, place them back in the refrigerator to keep cool until the meringue is ready. In a mixing bowl over a slow simmering water bath, combine egg whites and sugar. Whisking constantly, heat the mixture to 140 degrees F. Whip the meringue to firm peaks. Pipe the meringue in a spiral motion over the top of the chocolate mousse. Burn the top of each meringue with a torch. In a medium pot, bring milk and heavy cream to a boil. Turn off heat and add peppermint tea bags and let steep for 20 minutes. In a medium bowl, whisk together sugar, egg yolks and milk powder until mixture is a pale color. Remove tea bags and bring liquid back to a boil. Temper the boiled milk into egg yolks to bring temperature of the yolks closer to the temperature of the milk so eggs do not cook when you add them to hot mixture. Add egg mixture back into the pot and cook until it coats the back of a spoon. Strain through a fine mesh strainer and cool in an ice bath. Freeze in an ice cream machine according to manufacturer’s instructions. Pull the flourless chocolate cakes out of the refrigerator about 20 minutes prior to serving them. Place each on a plate and add a scoop of peppermint ice cream. Serve immediately.